The world’s first monthly subscription service for bassists. We are excited to announce a new monthly subscription service called BASSBOX™. 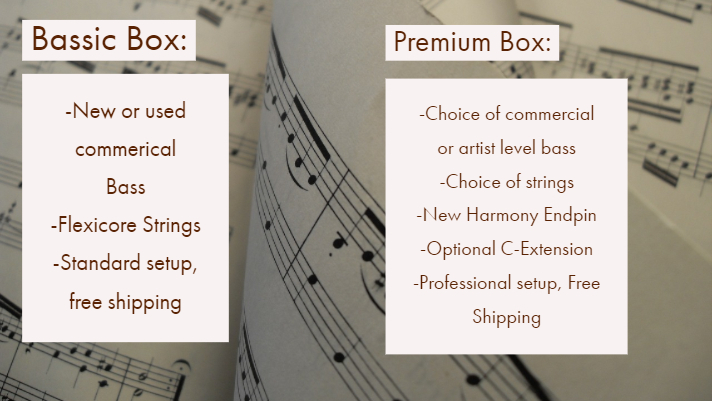 With so many different monthly subscription services available from HelloFresh, to Trunk Club, to Birch Box, we here at Chicago Bass Works thought it was prime time to launch our new service BASSBOX™. A new or vintage double bass delivered to your door. Every. Month. Each bass comes packed in our patented BASSBOX™ shipping container. Ensuring that your bass is delivered safely and on time. Made from Eco-Friendly recyclable materials that easily break down, or can be used to make a bass stand. There is a limited number of subscriptions available so sign up today! !